Form design is a balance of science and art. It must be functional and clear but also attractive and a reinforcement of the business’ brand. This form was designed to be used by the US-based business Lawn Army and their franchise owners. It needs to help customers quickly see their service options as well as assist in office-based requirements. 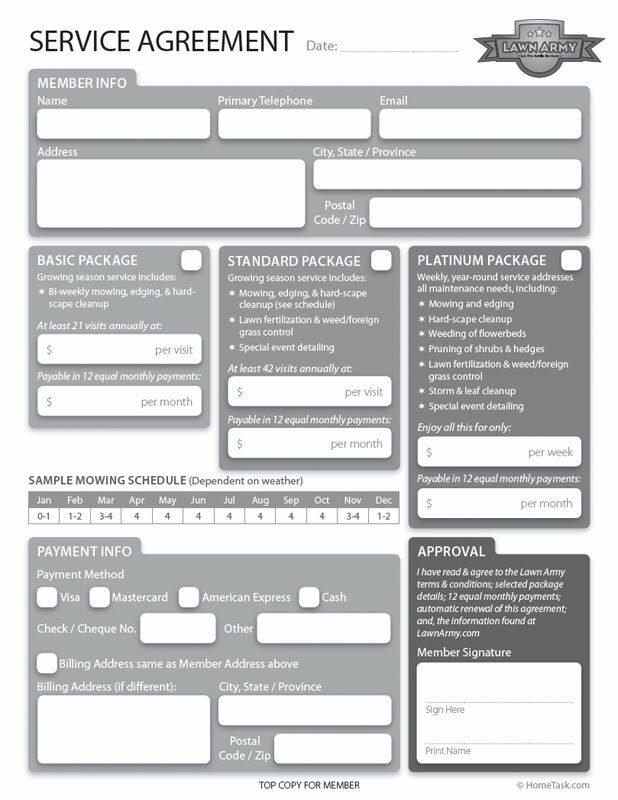 This form design was achieved by firstly splitting the form contents into four clearly defined areas: Member Info; Packages; Payment Info; Approval. The restriction of needing to be ‘home printer’ friendly meant designing the form without the use of colour and with reasonable edge margins. Even with these restrictions, the areas and sections are visually distinguished by using varying levels greyscale shading.